Sweetness from the CAD files above. These 3D files are created from our final resin/styrene prototypes samples. This is the stage where we make even more changes to the final design for our mold makers. The Brass Master! This solid chunk of brass is quite heavy. It’s the first stage in the making of the body mold. 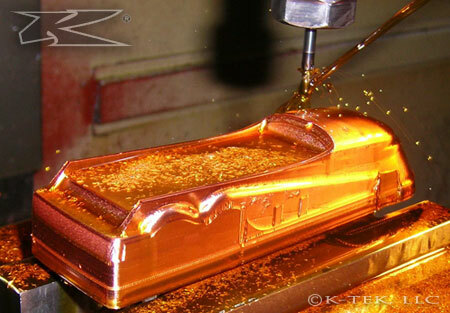 Thanks to Rocky, our mold maker for this great shot of the production process. It’s been quite a challenge going over all our molds and refining them over and over to get them perfect, but that’s what it’s all about: the perfect design! 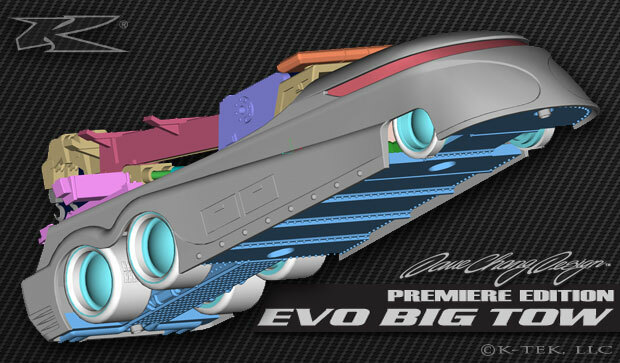 So…let me introduce to you, Your EVO BIG TOW!! A rare peek of a aged and un-refined 2006 Concept, handmade by our model-maker in China. He is amazing! To think from verbal instructions and sketches, he builds this masterpeice. It’s difficult to tell but the whole body is absolutely a different shape from the height and width of the body compare to the final version. This is one of the later version resin prototype. The very “First Shot”, from the mold testing stages. This very first painted version was used for fitting of all the parts. Although it looks great, every mold was sent back to our mold maker for fine tuning. I love how sleek this monster looks from every angle. Your gonna luv it!! Let me know what you guys think… Dave C.
Congratulations on this new model’m already waiting to make my request. Allow a suggestion, in red paint with chrome wheels or black background will be amazing. Yes Yes Yes, mate you have done it again. Congratulations from Australia. I can’t wait for this version . I work for a wrecker service and promise that this will be proudly displayed at work and will become the center of my wrecker display. I would also like to make a suggestion that you produce one in RED with CHROME wheels. Looks AWESOME!! Can’t wait to get one! Amazing! I want 5 of them! Saweet indeed! Looking forward to having one in my hands. Great job Dave and crew! Beautiful, great innovation, certainly comes to the collection. Man you hit it out of the ballpark. Artistic marvel at its finest. I gota have this one to add to my collection! Dave, this looks great! A must have for everyone who has an EVO. A sure sell out. Can’t wait to see the final production. This latest design is simply awsome. My Grandson (5yrs) loves tow vehicles and will LOVE this one. Youv’e come up with another winner as we all know you can. I will be placing my orders on this “EVO-TOW”. Thanks for your talent and ideas. How Do You SAY…P.E.R.F.E.C.T.! that’s what you’ve done this tyme! The ULTIMATE “COLLECTABLE”…..I Persannaly Can’t Wait Till There Available! Keep UP the GrEaT Work! WOW that is frickin’ saweet!!!!!!!!!!!!!!!!!!! Hi Dave, Just beautiful! You do such fantastic work and cannot wait to ad this casting to my collection. Nice work. From the angle of the pictures the crane looks a little oversized for the body. Can we have more pictures to get a better perspective on the body to crane ratio. No matter what Im still buying at least 2. Awesome job!! 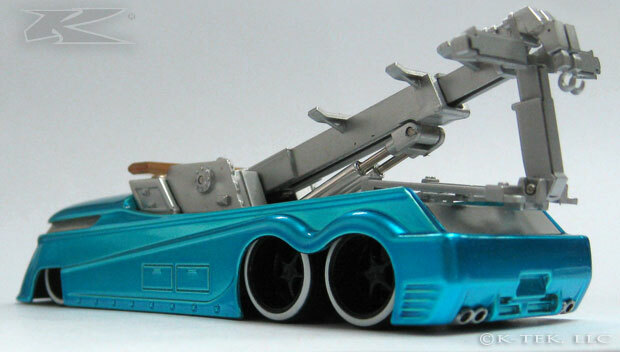 I like to play with my toys once in a while and wondering if it will tow one of my other evo’s in my collection? Is this a working tow? Hey Miguel!! LOL, I wouldn’t really tow anything as big as another EVO, the hooks would not work, but the boom works and retracts. It looks so kool! WOW!!!! You guys couldn’t have done a better job on that baby. Very nice and really sleek for a tow truck. Can’t wait to get my hands on one. OMG!!!!!!!! !, This is awesome to say the least. The orange and white with black flames and wheels is going to be perfect, if in fact that is one of the color schemes, as on the front page of the homepage. Whatever colors, I am anxiously awaiting sale day. Great job to everyone involved. Dave, This is looking very cool! Can’t wait to see what kind of paint job it gets. I gave up being astonished by the beauty of these long ago. Now I just sit and dream of the day this one will become available. These always draw the most attention and admiration of the many vehicles in my collections. NICE NEW CAR, D. 🙂 AN ORDER FOR ME PLEASE! Another home run! I am curious as to what the boom and moving parts will be made of? The moving parts would look awesome chromed. I also want to thank you for the spring clearance sale as i was able to get a lot of issues that i had previously missed. when can I get one . You did a good JOB. W O W….. that diecast is bad to the bone, and can’t wait to own! Dave Chang is the man, I too am a big fan! Lowered and colored as they are all numbered, I wish to own one of the first hundred…. It’s definitely different from your other buses, which is a good thing. But is that all Plastic?? Please tell me its Die cast…. Hey Miles, it would be too costly but also not practical for the back half to be metal, it just wouldn’t function right. The ‘hydraulic’ boom shaft(?) has the metal pin for realism, and of course diecast body and chassis! I understand about the cost. You can always put some AIR shocks on the bad boy to handle the die cast. Very cool! 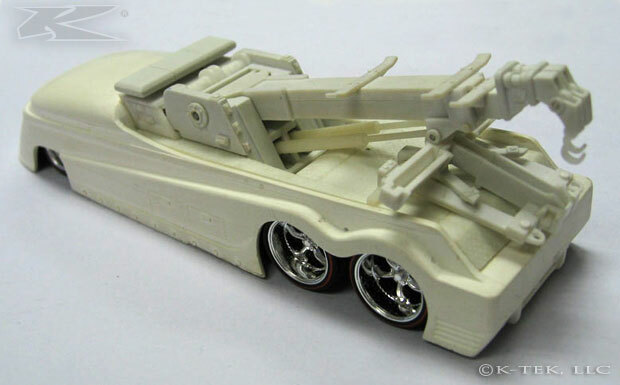 How much detail painting will you be doing on the towing parts? Hey Mike, the answer is lots, for color variations and tampos. Well, I guess i could always settle for the resin one, LOL. Will you post pics of the completed brass body ? Dave,you and the rest of your crew actually make an item worth spending a few dollars for,this car/truck looks like another of your great designs and like the others my grandsons and I will continue to buy as long as you continue to produce.Coach. Looks fantastic! Would be even better in a POLICE or FIRE dept paint scheme! This is sweet. I can’t wait to buy it. Yes baby! Very nice, bring it on! WOW WOW AND ANOTHER WOW.THAT LOOKS FANTASTIC.AS A HEAVY TRUCK TECH,I CANT WAIT TO GET THIS ONE.HOPE TO ACTUALLY SEE IN ORANGE. THANKS TO YOU AND YOUR TEAM FOR ALL THE RELEASES SO FAR. Looks great cant wait to see it!!!!! Love that detail and originality! Kudos DAVE! That idea of painting it like a woody is fantastic! I want one for sure!!! when will it be available? Just when I think I’ve got my favorite one you drop this on us ( my new favorite by far. While red and chorme would look outstanding, I would suggest a simple clean pearl white with blue accents and chorme rims. But at the end of the day I will buy whatever color you come up with, your the pro!!! can u put my name on ur new car’s license plate?! PLEASE!!!!!! Thank you Dave for your attention to details and your commitment to excellence. money in the bank you’ll need a ‘tow’ for all that dough.!! I’de like to see it in a candy black cherry with phantom dark red flames, and black chrome rigging and wheels, but like most, I will buy it no matter what color. Oh, and the autographed chase is a great idea. Just Plain AWESOME, Thank you I’m looking forward to adding one or two to the others. Thanks for your art. That’s one slick “BRUTE”. Tow me away. WOW, amazing new casting. David and Team you just amaze us all with the ideas you come up with. This EVO will be just as cool as the ones prior. Cant wait to get one. How about red chrome with some black flames and chromed boom? Add in some fire dept. tampos. That would be totally awesome! Dave, did i hear you hmmm about a fire version down the road? With perhaps a ladder instead of a boom? Also a great idea!! Dave; any hints as to the cost ? Hey Joe, not counting all the tooling costs, the “Big Tow” costs more to produce per unit as you can see with all the parts on that workhorse! We were struggling with price, but are most likely going to keep the costs the same as previous without a price increase. So you’ all be smart and take advantage. We are absorbing all the extra costs. I guess you can say here that we’re giving back to all our great fans. This is one SWEEEET EVO. 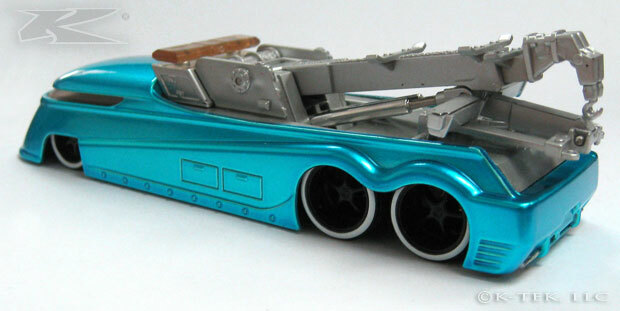 As you know we just started collecting your amazing creations in diecast. This is a must have :). Thanks for giving us a SNEEK PEEK. Hello Dave, will you be having a 7 piece collector set with all the chase pieces??? Looking to grab one if available. PLUsK. Hi Ray! Thx, most International customers order with a credit card, it’s the best way w/o a ppal account. Thanks for all your great creations in all of your work. Dave you have built another great piece. Just not sure of it’s ability to equal the looks of your past drag buses. I wonder about it just looking like a add on. Will it function too. Can we get some print on the tow equipment ? How about Chang Gang Hauler for a Co. name. Keep up the great work. Your work is loved by many of us. Yes, total production run will be the same as the last series. Killer piece Dave…….can’t wait to see them with some paint flung on them! Hi Dave and staff , i am Patricio from Argentina , and I astonished by his products, I and my friend Alejandro for a few months discover these beautiful cars and we try to buy all, In the 16 edition there was a problem and I could not buy the whole series, I hope that this does not happen again. From the design, the presentation, the box, everything is perfect, you have a wonderful product ,continue on this way. As always, another WINNER from Dave Chang ! What an idea! Looks too cool, keep exciting us! i think it should be on sale already!!!!!!! Only thing sale begin end of July .. well tomorrow will be the last day in July! FREAKIN’ AWESOME!!!!! How can I book one in advance. Your best work yet IMO. Gotta love it. Can’t wait to purchase this one Dave! Awesome work as always! Only 5 more sleeps to go! Great work Dave & team. Dave just to let you know I was able to purchase a set (7) for my personal collection. Can’t wait to receive them!!!!! Awesome guys, congrats on the Masters! I am really looking forward to seeing these in the cabinet. I was a bit leary when I heard the rigging was going to be plastic, BUT, as it turns out, the buses turned out fantastic, as usual. The pictures don’t do these justice, in real life, they are amazing.